Clean, soft leather starts with Leather Master! 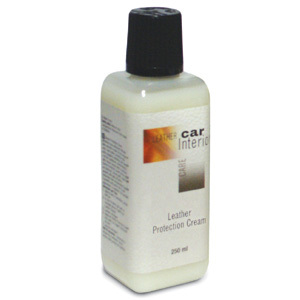 The Leather Master Car Leather Protection & Cleaner Kit provides a gentle cleaner and protective conditioner for regular leather care plus Ink Away for those accidental mishaps. This combination from Dr. Tork Laboratories provides complete care to maintain clean, soft, smooth leather seats that are protected from everyday soil and wear. With Leather Master, leather upholstery will look and feel like new for years to come. Ink Away works well for removing ink, lipstick, and pen marks. It is designed for removal of recent (3 - 5 days) ink on leather. Ink Away works best when used on leather that has been protected with Leather Protection Cream. Do not use on Nubuck and Suede. Leather Soft Cleaner is a mild water-based cleaner that effectively removes day to day soil and water-based stains from leather upholstery. Soft Cleaner will not dry out leather or change its properties. Soft Cleaner is solvent-free and safe on all types of leather. Leather Protection Cream nourishes and protects against all kinds of soiling, water, alcohol-based stains and perspiration marks. Leather Protection Cream is oil and water repellent. Leather Protection Cream places an invisible, breathable barrier between you and your leather. This way you are not actually cleaning the leather’s original surface, but cleaning from the surface of the protection. Since some leathers are very porous, the Leather Protection Cream prevents stains from absorbing deeply into the leather and becoming nearly impossible to remove easily. This product is not suitable for suede or nubuck. Use the soft sponge to apply the products in this kit. Use different sides of the sponge to apply the cleaner and protectant to avoid cross-contamination. With regular use of the Leather Master Car Leather Protection & Cleaner Kit and Ink Away, leather will retain its original appearance and soft texture. This kit brings back the original satin sheen to leather that has been "polished" to a gloss by soil. This glossy appearance is a sign of wear. Use Leather Soft Cleaner to remove the soil and Leather Protection Cream to restore the natural appearance of leather. Leather Master products are made by Dr. Tork, a specialist in the care of leather. Dr. Tork holds more than 100 patents. Trust the expertise of Dr. Tork and his team to give your vehicle's leather upholstery what it needs to stay clean, soft, and inviting.